Two goals from Jon Walters helped the Republic of Ireland seal a 2-0 win over Bosnia-Herzegovina to clinch a 3-1 aggregate play-off victory and a place at Euro 2016. But what were the secrets to their success? Injured Republic of Ireland goalkeeper Shay Given, former internationals Mark Lawrenson and Ray Houghton, as well as Irish football journalist Miguel Delaney spoke to BBC Radio 5 live about Ireland's qualification. The quartet looked at the secrets behind Ireland's success, how they have benefitted from 'a club atmosphere' and how they could fare in France. A failure to qualify for the 2014 World Cup saw former manager Giovanni Trapattoni leave his role in charge of the Republic side in September 2013. Martin O'Neill, with Roy Keane as his assistant, were the men to replace him and they have been instrumental in guiding the side to France 2016. Lawrenson, who won 39 caps for Ireland, said: "The secret of being a top manager is that you get a little bit extra from every player and that's what Martin O'Neill does. It's a fantastic achievement. "He has probably had the least talented group of players available of any Irish manager who has qualified. But it has all been about the sum of the parts. In golfing terms, they are eight under par." Given: "We didn't know what they would be like but they have bounced off each other brilliantly. Everyone respects both of them so much and when they speak you respect them in the dressing room and listen." Houghton: "Martin has grown into the job and has got more involved, the same with Roy Keane. This means so much to Martin. Jack Charlton was the last manager to qualify in his first tournament and Martin has done it." The Republic's side against Bosnia-Herzegovina included players playing for Championship sides Derby County and Ipswich Town but our pundits believe the team spirit, and a lack of superstars, has been vital in their success. Delaney: "There's no doubt that in terms of quality it's probably our worst generation in 25 or 30 years. "The club which we have our best players from is Everton and in the past we had Roy Keane at Manchester United and one or two players that elevated the side. "In that sense, probably, we're the Stoke City of international football but with the awkwardness that brings." Lawrenson: "Throughout the games they have had to pick Championship players and that's why this achievement is greater than before. In other Ireland qualification teams they have had four or five really top players, but there are no superstars in this squad." Houghton: "Since the first game it has been a lot of effort, a lot of blood, sweat and tears. We haven't got the flair players like other international sides but every player that pulls on that green shirt gives 100% and goes into battle with everyone." With four games to go in their qualifying campaign, the Republic's hopes of finishing in the top three looked slim. But rivals Scotland lost 1-0 in Georgia before the Republic claimed a 1-0 home win over 2014 World Cup winners Germany to reach the play-offs. But again they faced a difficult task as they were drawn against the toughest opposition they could have had. Given: "Right from the start it was a tough draw. We had the world champions Germany, Poland and Scotland so it was the toughest draw of all of them. "Then we had the toughest draw in the play-offs in Bosnia, who were the highest-ranked team. "But we're all in it together, every single player is proud to put on the jersey and you can see what it means to them." Houghton: "I was in Faro when Republic of Ireland were playing Gibraltar and Scotland were playing Georgia. "It was flat around the stadium as everyone was thinking Scotland would get a result. We're just delighted to be there and it looked for a spell that we wouldn't do it." How will they get on in France? In 10 group games, Ireland only conceded seven goals, two fewer than world champions and group winners Germany. Our pundits believe the defensive strength will serve them well in France. Delaney: "Given that we have got a record of getting through groups, and this is a more open tournament, you would fancy getting through the group and into the last 16 and that would be a success. "I interviewed Bosnia goalkeeper Asmir Begovic and he said he envied Ireland's resilience, tactical organisation and work rate. There's that club spirit that many international teams lack." 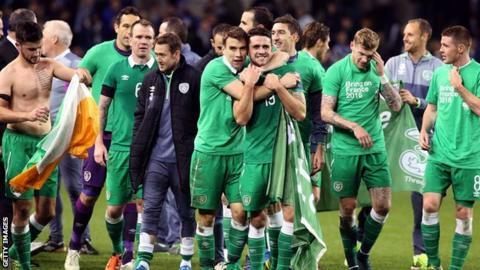 Lawrenson: "England would not like to face Republic of Ireland and we would be very good at stopping England play." Who has qualified for Euro 2016?